Arowana Mall is a multiplayer stage in Splatoon and Splatoon 2. Arowana Mall is a narrow battlefield that is set at an outdoor mall, decorated with stores, plants, banners and advertisements. It features two lower sections and one raised section in the center of the map that connects the lower sections. Arowana Mall is long and relatively narrow with multiple large, central areas and hidden side passages. The spawn point area is accessable to the enemy team. The only way for one team to get to the other side of the map is by going through the center. In the center of Arowana Mall is an area connected by two ramps, with relatively large areas at the bottom of the ramps on each side. This location is the site of many skirmishes, but getting around it is simple, as both teams' territories are connected by narrow side passages. On both sides of Arowana Mall, two side passages connect each team's Spawn Point to the central area. However, a team's base cannot be directly accessed through these passages if a player is entering from the central area. In order to access these passages, players must swim up small walls located in the Central Area. Each team's base is an open area with access to their side passage and and a lower area that leads an area connected to the central area. It also connects to two platforms near the central area that provide a fast way to ambush the opposing team there, and snipe players from a safe distance. There is water around the center and an abyss to the right side path as hazards for players to get splatted from. Arowana Mall received a few changes to the bordering paths in Splatoon 2. The raised plaza to each team's right side now has a grated bridge that connects it with the central platform. To outer path on each team's left, a second raised path that goes behind a wall was also added. The Splat Zone for Arowana Mall exists in the very center of the stage where all paths meet, and is overlooked by multiple hallways or platforms. In this mode, the side alleys are now linked to the other side of the map via an added grated walkway over the pools of water. The tower in Arowana Mall in located at the center of the map, replacing the information tower. The goals are located at the base of each teams' ramp in the lower area of their Base. When ridden, the tower proceeds to the riding team's right, placing itself over water. It then goes to the center of the pathway to the opposing team's base and continues on to the goal. The first checkpoint is located in front of the ramps leading to center platform. The second checkpoint is located right before small quarter pipe leading into the enemy plaza. The Rainmaker begins in the center of the stage, in place of the the informational tower that appears in Turf War and the tower from Tower Control. The Rainmaker must be taken to the platform found inside the lower, rectangular areas below each team's spawn point. The basket is located at the right side near the lower section that is closer to the center. There isn't any bump near the basket. There is an inkrail to the left of the lower section to get to the basket. Arowana Mall underwent a series of changes between its development period and release. There was much less verticality. The current side alleys were not present. The ramps were very small. There was much less water, as well as fewer grates. There was a raised, U-shaped Glass platform in the center of the stage. The buildings that formed the stage's walls were much different. Two palm trees were added to the lone planters of both sides just left before entering the center of the map, protecting the player from Inkzookas and Rainmaker shots. Two signs were added at the exits from the side areas to prevent sniping from the side they belong to. An official picture of pre-release Arowana Mall. A large view of Arowana Mall and the U-shaped platform. Inklings battling in the central area. An Inkling preparing to Super Jump next to small ramps. Inklings jumping over some ramps. The palm tree that was added in the released version. The added sign that was added in the releaed version. Arowana Mall was released with launch of Splatoon. 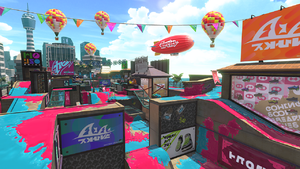 At Version 2.6.0, Arowana Mall uses the Splat Zones version for Turf War which includes grates and more platforms around the Central Area letting players attack the center more easily and a stack of boxes to one exit of the side alleys. The grated walkways that connected the side alleys are removed however. Adjusted stage layout in all modes. Adjustments to stage layout in all modes to prevent users from swimming over some of the ledges. Adjustments have been made to prevent users from taking certain shortcuts in all modes. Added prohibited areas in Walleye Warehouse, Saltspray Rig, Arowana Mall, and Flounder Heights in Rainmaker mode. 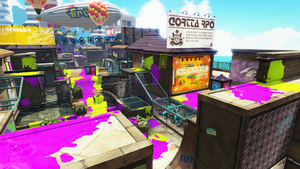 The layout will be based on the stage layout in Splat Zones, but the grates that connect between the high platforms in each team's area have been removed. Adjustment have been made to prevent players from taking certain shortcuts in all modes. Green Inklings move into the center area. A road outside Arowana Mall, inaccessible but visible by looking over the edge. Arowana Mall during a Splatfest. An Inkling pushes a Splat Roller at Arowana Mall during Splatfest. A promo for Tentatek at Arowana Mall. A Side Alley in Arowana Mall. Splat Zones being played in Arowana Mall. Some posters with the SquidForce logo on a wall. The map of Arowana Mall in Turf War before update 2.6.0. Arowana Mall was released at 2 February 2018 of Splatoon 2. From March 1 until March 16 of 2018, Arowana Mall was not available in Splatoon 2 due to a notable bug. When players use a Dualie here or use the Splashdown, the game acts as if they’ve fallen out of bounds of the terrain. Fixed an issue in Arowana Mall that allowed players to climb over a specific barrier railing, gaining access to the enemy spawn location. Fixed an issue on Arowana Mall in which, if the player activated the Splashdown in a narrow place between a fence and terrain, the player would go into the terrain. Fixed an issue on Arowana Mall in which the player would be repelled in an unintended way when having moved into a narrow place between a fence and terrain. Fixed an issue on Arowana Mall in which bombs or bubbles from the Bubble Blower disappeared in an unnatural way around the central pond. Slightly adjusted the position of the sign indicating the area where the Rainmaker can’t be carried on Arowana Mall in Rainmaker, making it more difficult for a player to get stuck between the path and the sign. Fixed an issue on Arowana Mall in Rainmaker in which the Rainmaker would reappear inside terrain after the player holding the Rainmaker went beneath a high platform near the center and then lost the Rainmaker. Issues where players would slide or perform a super landing in Arowana Mall would sometimes lead to them being treated as though they landed outside the map have been fixed. Standing on the palm tree outside Arowana Mall. It is possible to jump out of bounds into the beach area outside the map via the side alley. 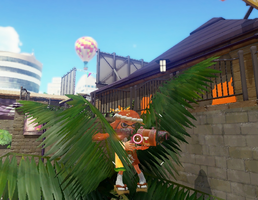 The player is instantly splatted if they fall completely out of bounds, but it is possible to stand on the palm tree just outside the map. There is no way to get back, though; from there, they must jump off and be splatted. The map's name is based on the real life arowana, known for its long, slender body and ability to jump great heights. The reference is therefore particularly well-suited, as the map has many large ramps and and steep cutoffs and is long and narrow in shape. Prior to Version 2.1.0, a glitch existed in which players could jump through an unclimbable ledge in a side alley into the opposite team's base. It has since been patched out of the game, and unpatched in Version 2.4.0 and patched in Version 2.5.0. The mall's closing tune can be heard when there is one minute left in a battle. Arowana Mall and Walleye Warehouse are the only stages available from the game's initial release not to be featured in Octo Valley missions. The internal codename for this stage in the game files is "Updown". Arowana Mall is derived from the nouns Arowana and Mall, Arowana is a freshwater fish and Mall is home for many shops and sales. アロワナモール Arowana Mōru is derived from Arowana and Mall. ↑ These features appear in Tower Control, Rainmaker, and Clam Blitz. This page was last edited on 25 March 2019, at 20:57.